Peter was born on 14 March 1819 at Wallsend, Northumberland to parents Peter and Isabella. He was baptised on 10 October 1819 at St Peter’s, Wallsend. Peter , senior, worked as a pilot and died when Peter was two years old. As a young man he went to work in the coal mine to supplement the family income. When he was 15, the family moved to Backworth, nr North Shields. At the age of 20, Peter was converted at the Benton Square Chapel. He soon became a local preacher. At the age of 22, Peter was called by the Durham Circuit into the ministry. Peter almost immediately resigned after a rude comment by a chapel official during his first sermon. His mind was changed by a woman who approached him just before the Quarterly Meeting and told him that he had been the instrument of her conversion through that first sermon. Peter had a commanding presence, a powerful voice, an ardent temperament and Christian zeal. Peter’s obituary records that up to 2000 persons professed to be converted under his preaching. 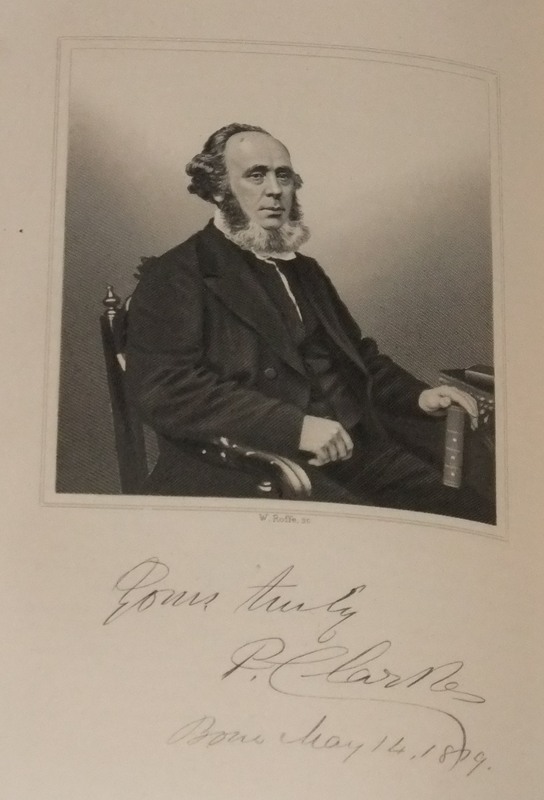 Peter married Frances Carver (1819-1873) on 17 March 1846 at the Temple Chapel, Ripon. Census returns identify three children. Peter married Ann Falconer, nee Dickinson (1833-1899) on 20 June 1876 at Nelson St Chapel, Newcastle upon Tyne. Rev. Henry Phillips officiated at the marriage. Peter died on 10 February 1878 at Whitby, Yorkshire and was buried at Jesmond cemetery. Hi Geoff – Many thanks for your encouraging reply. Will try putting together a webpage. Meanwhile I’m sending some hard copy info on Peter Clarke’s family & links with other PM ministers to the Museum. Included are copies of both of Peter’s marriage certificates. His second marriage was to a 43 year old widow called Ann Falconer. It took place at the Nelson Street Chapel in Newcastle-on-Tyne on 20 June 1876 (a bumper year for Clarke weddings!). Henry Phillips officiated and Peter Watkin Clarke was a witness. Hope this is of interest. Evelyn, Thanks for your comment. It would be very interesting to see the link with the Proctor family. You could add a page yourself or send an e-mail to the Englesea Brook Museum. You will find the e-mail address by following the link ‘About us’, then ‘Contact us’. Delighted to find this excellent site and fascinating entry about my great, great grandfather Peter Clarke. My grandfather Albert Carver Clarke was his grandson. My research suggests he was linked by his son’s marriage to another PM family in the North East – the Proctors. Would my family “map” of this link be of interest? I can attach it to an email. Many thanks again.